When it comes to sleep and medical botany, there are very few plants as well-known as Valerian. It is frequently used both on its own and blended with other herbs or plant extracts. Though not a North American native, it grows abundantly in the US. It’s even considered weedy or invasive in some States! Here we’ve put together a short description of Valerian, followed by entries on other plants commonly paired with it. You’ll see these pairings in tea blends, some of which we will note below. The combinations may also appear in supplements, tinctures and other forms. Always consult your doctor before trying these remedies. Just because something is natural doesn’t mean it’s automatically good for you. As with traditional sleep aids, don’t mix with alcohol and don’t operate machinery after taking these natural alternatives. 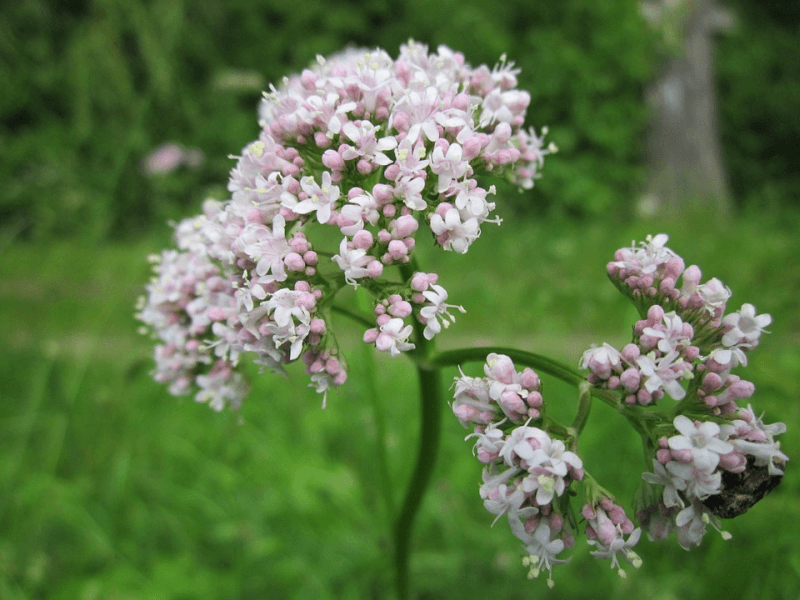 Valerian (Valeriana officinalis) is said to be a potent and natural sedative. The extract from the root of this perennial flowering plant is what’s considered medicinal. This is why it’s often referred to as Valerian root. It is also known as All-Heal, Garden Heliotrope, Garden Valerian, and Setwall. Valerian is native to Europe and parts of temperate Asia. To most, Valerian root can be a safe and moderately effective natural sleep aid. It has the potential to increase both sleep quality and duration, and may even help with sleep onset. Valerian has been studied as a treatment for insomnia and other sleep disorders. Apart from being a sedative and tranquilizer, it’s also been known to act as an analgesic, anticonvulsant and antispasmodic. Valerian root is even said to lower blood pressure. Want to give Valerian root a try? Take the proper dosage in the form of tinctures, tea or capsules. A word of caution: Some may find that they are sensitive to the effects of Valerian root, and the side effects may outweigh the benefits. Plants Paired with Valerian Root in Teas, Tinctures, Etc. If you’re already on prescription sleep aids, it may not be a good idea to use Valerian root on top of that. However, Valerian root is sometimes taken with other plant extracts. Ingesting Valerian root as part of a blend or pairing may help with the rather unpleasant taste and smell, and mitigate possible grogginess upon waking up. Below are some of our favorite plants paired with Valerian root. This plant is also known as camomile, German chamomile, Matricaria chamomilla, and wild chamomile. It is native to Europe, North Africa, and parts of temperate Asia. When we think of chamomile, we are actually thinking of two distinct plants: the popular German chamomile and the less common Roman chamomile (Anthemis nobilis). 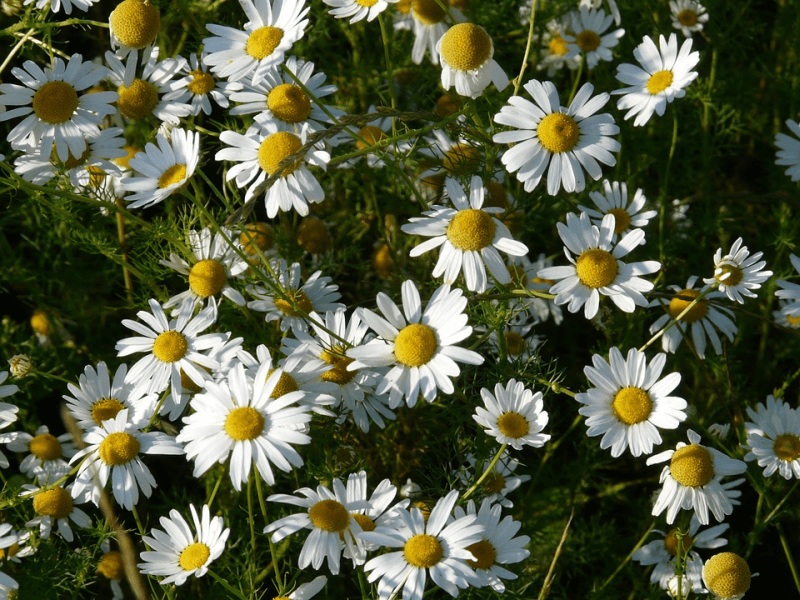 German and Roman chamomile share many medicinal properties, but we will stick to German chamomile for this article. Chamomile is looked at as both an anti-anxiety agent and a sleep aid. It’s used for anything from irritability to insomnia, even as a topical anti-inflammatory sometimes. Abundantly cultivated in the US, it is easy to source and very popular. On its own or as part of a mild blend—usually with ginger, lavender or lemongrass—it is best taken the time-honored, traditional way: as a cup of tea. Chamomile combined with Valerian root is more potent, but no less soothing. Both are associated with pain relief. Chamomile provides a delicate touch of relaxation, while Valerian root contributes a strong calming effect that reduces anxiety and agitation while inducing drowsiness. The two are best taken together as tea. In fact, this pairing is often part of complex tea blends with three or more ingredients. Chamomile and Valerian root also appear together as ingredients in specially formulated dietary supplements. You can also learn more about the latter by checking out our in-depth ORB Sleep Complex review. This plant is also known as haw, maythorn, motherdie, and oneseed hawthorn. It is native to Europe, Northwest Africa, and Western Asia. The fruit of the hawthorn shrub is edible and is used as a natural remedy. Modern medical botany uses the flowers, twigs and leaves more often for extracts, though. They are believed to contain more antioxidant phytochemicals. Hawthorn is a well-known treatment for cardiovascular problems, and also has a long history as a sedative and neurotonic. It’s been used in treating mild sleep disorders and minor stresses and pains. Hawthorn tea is typically tart or sour. It may be used to induce a calm and peaceful sleep. There are also tinctures available. As this member of the rose family grows abundantly in the US, sometimes even in the wild, you may try preparing the tea or tincture yourself. Common pairings include lemon balm, St. John’s wort and the North American native goldenrod. Hawthorn combined with Valerian root may be found in both tea and tincture form, though the former is less common. Together they work to relieve nervousness and regulate the body’s heart rate, potentially slowing down palpitations and normalizing irregular heartbeats. The pair is frequently blended with either lemon balm, peppermint and others for an extra calming and relaxing effect. You may also find blends focusing on heart health more than better sleep. This plant is also known as common hops or European hops. It is native to Europe and Western Asia. The flowers of this plant are well-known for giving beer its bitter flavor. As its popularity in the use of beermaking spread throughout the West, its sedative properties came to be observed. Why? Workers tending to hop fields tended to fall asleep on the job more than usual. 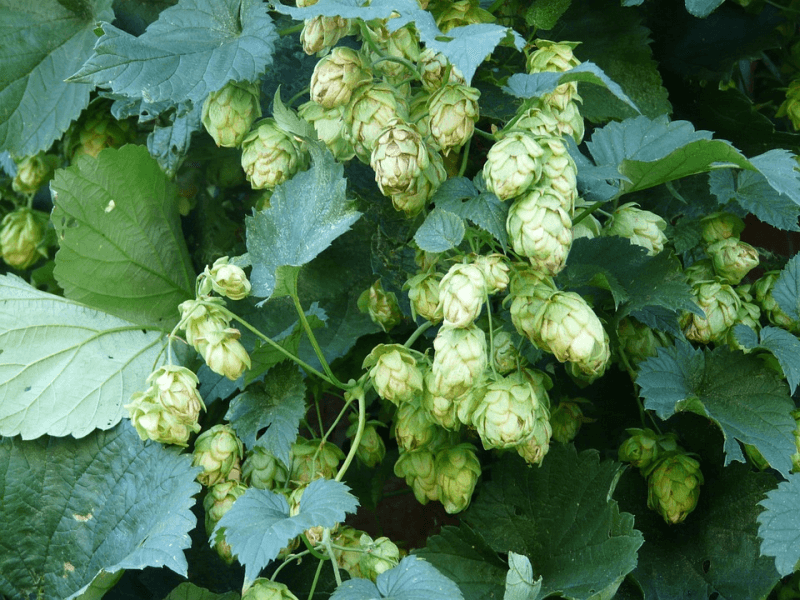 Hops have a rich herbal history. It’s been used as a folk remedy for many ailments, ranging from dyspepsia to rheumatism and more. Hops may help with sleep problems and menopausal complaints like intestinal cramps or hot flashes. If all this sounds like it’s too good to be true, it is: Drinking beer containing hops is not recommended for better sleep quality! The alcohol may cause disruptions during slumber. On its own, it can be consumed as part of non-alcoholic beer, though dosage will be difficult to manage. As a tea or tincture, it is bitter but better in terms of controlling the amount. Hops combined with Valerian root has been studied as an alternative treatment specifically for insomnia. It is not popular as a tea blend because neither hops or Valerian root taste great on their own. Looking for this pairing? Try tinctures or dietary supplements. You can also learn about the latter two by checking out our in-depth reviews of Nested Naturals LUNA and Jarrow Formulas Sleep Optimizer. This plant is also known as goatweed, Klamath weed, rosin rose, and common St. Johnswort. It is native to Europe and Western Asia. The flowers and leaves of St. John’s wort are used in medical botany as more than just a sedative or to calm nerves. 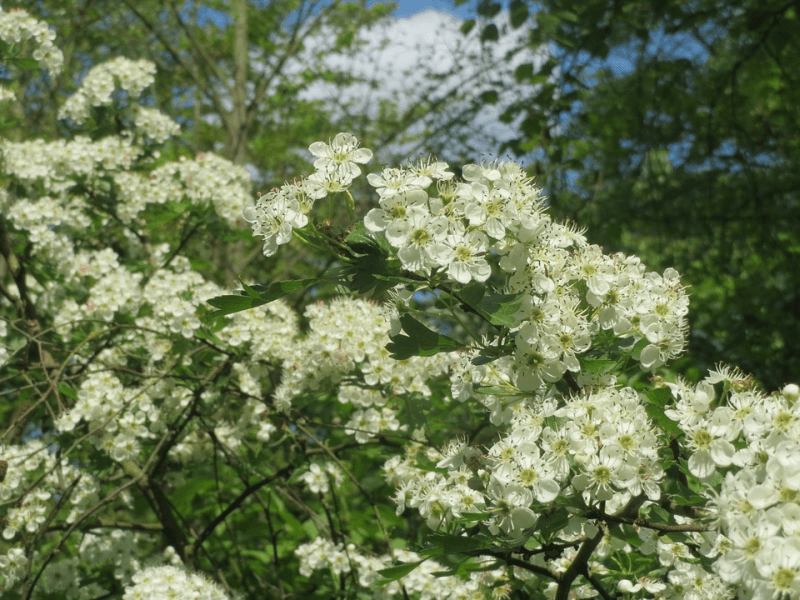 Similar to hawthorn, this plant has a rich history as a medicinal plant. 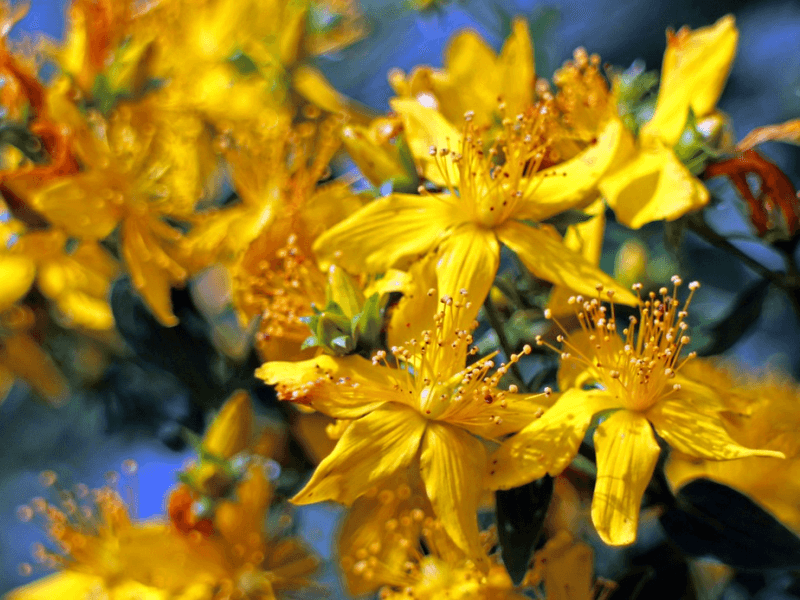 St. John’s wort is most known as an alternative treatment for depression. As sleep health and mental health are intertwined, it makes sense that St. John’s wort may also have efficacy as a sleep aid. In traditional folk herbalism, it has also been used as an analgesic, antiseptic, antispasmodic, antiparasitic, digestive, and to promote the healing of wounds and insect bites. On its own, you can can take St. John’s wort in capsule, tablet, or its noteworthy vivid red tincture form; but St. John’s wort tea is actually pleasant. It has a mild, woody taste with bitter and astringent undertones, but also a lingering sweetness as a faint aftertaste. Be extra careful with dosage, as too much may cause a variety of minor discomforts: stomach upsets, vivid dreams, skin rashes, headaches, or rare cases of photosensitivity. St. John’s wort combined with Valerian root is a powerhouse combination. It eases nervous exhaustion, helps with the weight of depression, and provides a relaxing and calming sensation leading the path to sleep onset. One study even concludes that this combination is more effective as an anti-anxiety treatment than Diazepam! You can take the blend as tea or tincture. Note: St. John’s wort with Valerian root may interact and increase the minor side effects associated with them; including drowsiness and dizziness.